Unique plots with a total area of ​​20,772 sq. 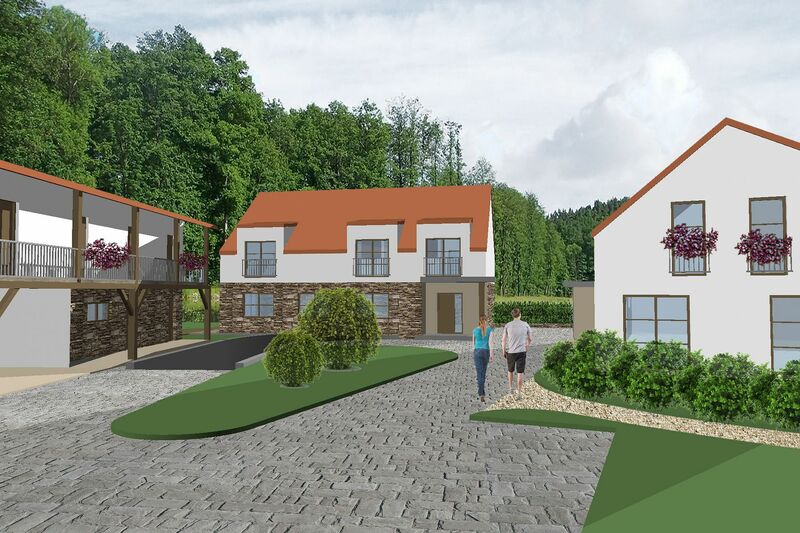 m. set in the beautiful countryside by the Rokytka River in the Prague district of Královice, which has a rich history. According to the valid zoning permit, it is possible to build 2 commercial buidings with a restaurant, underground parking, and accommodation services, as well as a house for the owner on the land. The plots of land are located on the site of a former mill. 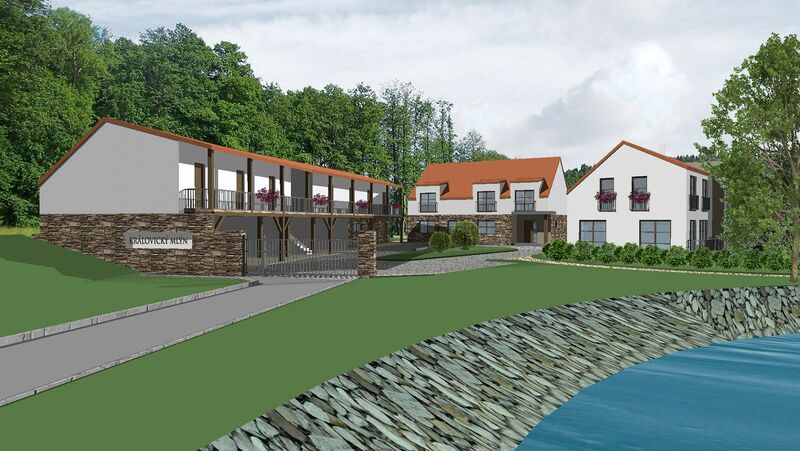 According to the project, a restaurant with 25 seats and 4 accommodation units are planned in the main building and 8 accommodation units in the 2nd building. 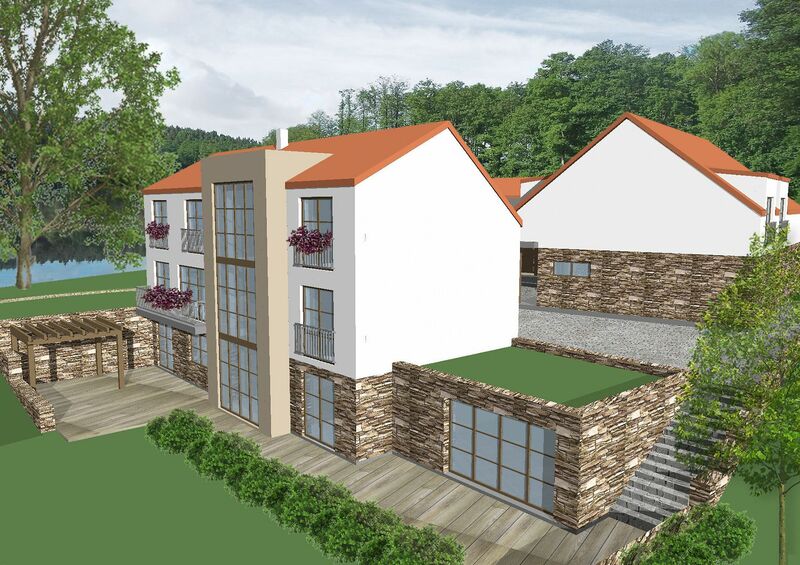 In the 3rd house, there will be a 5-bedroom apartment with an indoor pool, a gym, and a studio. All 3 buildings are planned as single-story with a residential attic. There is also an ancient orchard and a pond with an island on the plot. On one side, the plot is bordered by a small river, and the Rokytka Nature Park is nearby. The watercourse can be used, for example, to build a small hydropower plant. The property is connected to the electricity supply; the water line is 43 m away, there is also a water well. The plot will be connected to the municipal sewerage. There is a driveway with a road that will be paved with an asphalt surface. An ideal location close to unspoilt nature, yet within easy access and proximity to all services. There used to be a Slavic fortified settlement in this historical area. The Gothic church of St. Margaret and a medieval fortress have been preserved. There are several bike trails and a marked hiking path. There are also basic civic amenities (a private nursery and an elementary school (1st grade), a library, a tennis hall, a playground, and a pub), and other services are within short driving distance. Transport connections are provided by buses, which go to the Depo Hostivař metro station (line A).